My name is Heidi Easley and I teach step-by-step paintings to large groups. I also teach artist how to make extra cash throwing paint parties. In addition to that I love painting family portraits as Sugar Skulls! What inspires me today? A new project! Anytime someone commissions me for a new project I get inspired to create and see them happy when they see the finished product! 2. Please tell me a favorite story about your childhood? What positive life principle did you learn from your parents/caregivers - that still informs your life today? One day when I was around 14 I asked my parents if I could paint my bedroom wall what ever I wanted. To my surprise she quickly said YES! So I spent the next 2 years painting a giant Simba from Lion King (Out of proportion and the wrong colors) and teaching myself techniques. Now with my daughter when she asks about cutting up old shirts or material I always say yes! I love seeing what she creates and who knows what it will lead to! 3. Was there anything in your past that caused you pain, struggle or hardship? Share briefly if you feel comfortable. Yes, in 2007 my family lost everything. My husband lost his job and then our bills were already maxed. I had 3 different cars in 1 year. It was really embarrassing and I tried to hide it from my friends because of the shame of having to file bankruptcy in my late 20’s! After being paralyzed in fear for about 2 months I decided to paint some little surfboards I made out of wood to get my mind off of things. To use art to heal! I took the surfboards the to school I was working at to paint them at lunch and after school. The kids saw them and fell in love with them! After about 150 kids told me that they want me to make them a surfboard a light bulb went off in my head! Huh… I may be able to sell these! So I did. In just two months my family and I hand made over 1000 decorative surfboards and I hand painted each one to customer order. We made over 20,000 in just 2 months and it has given me the confidence to know I can always change my situation! I would say the bankruptcy was one of my lowest points. I was raised that if you borrow, you always pay back. Being in that position of total failure was devastating. My daughter was almost 1 at the time and I had just created her a brand new nursery painted as Tinkerbell’s fairy land. My daughter’s name is Pixie. We spent many months on that room making it perfect and then having to loss it was really sad. You know, people often ask if I regret how everything happened. I don’t. I know it was hard going through bankrupcty, embarrasment, changing cars, not being able to get loans, etc. But it taught me how to actually use money. My family now earns our money first THEN we spend. Crazy thought, huh! The confidence I gained that day when my surfboards started selling like hot cakes was a day that gives me confidence and drive EVERYDAY! Going from losing it all to knowing I had the power to change my families situation is so empowering. And, getting to do all of this with what I love, ART! Large painting! There is nothing like a big canvas that I can just have fun making backgrounds and textures. When people order my Day of the Dead Sugar Skull Family Portraits I feel like I should be paying them! The process I use to create the background is so fun! In the past I used to just find what other people are doing and copy. I guess it was my way of learning. When I started painting surfboards, customers would be really specific on what they wanted on top of my background. I had to paint SO fast to keep up with demand that I really learned how to have a style and learned how to create from my head instead of just what someone else came up with. I am a very passionate person! I love business, I love art, and the two together are what creates my drive! I feel like there are no limits and I know God is using me through Art. I can’t wait to see what’s next! Oh, and overall I’m an extreme optimist! I know the power that art has to not only calm a person, but really transform a person. With things like depression, anxiety, loneliness, etc. Art can give someone something to look forward to. I originally started my step-by-step painting classes just to earn extra income, but it’s become way more than that. Each class at least one person tells me a story or something about how art is helping them. The biggest compliment I can get is when a customer tells me that they bought paints and started painting at home. 12. What strength-based inspirational advice would you give someone who has similar challenges? Just when you think everything has fallen apart is usually when it all turns around in an extreme way! In my late 20’s, I thought my life was over. I thought that we hit bottom and that was it. Now I realize life is a HUGE mix of mistakes, failures, success and opportunities! Now when I fail I get back up a lot faster than before because I know that something better is on the other side! 13. What famous inspirational quote sums up your life journey? My favorite quote by Marianne Williamson: “Our deepest fear is not that we are inadequate. Our deepest fear is that we are powerful beyond measure. It is our light, not our darkness that most frightens us. We ask ourselves, 'Who am I to be brilliant, gorgeous, talented, fabulous?' Actually, who are you not to be? You are a child of God. Your playing small does not serve the world. 14. Create your own quote to inspire others on their life journey. Every time I hear a no, it just means I’m closer to a Yes! Heidi Easley lost everything in 2007 and used art to heal her soul and created surfboards. After discovering that her surfboards were a hit she sold over 1000 of them in just two months. This changed her life forever. After a move back to Texas she started holding paint parties to make extra income. 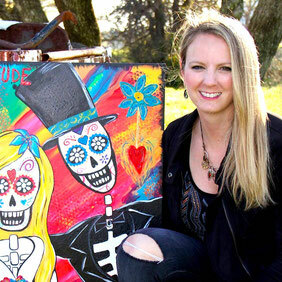 Since 2009, Heidi has held 100's of successful art parties and also works as a studio artist selling her cherished Day of the Dead Family Portraits! 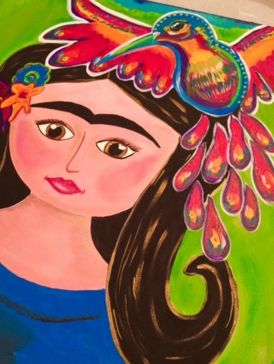 As a very passionate artist she thrives by helping others see the potential in art parties. Heidi loves showing others how to use art to heal your soul AND your bank account!